Director of the Harvard Center for Green Buildings and Cities Ali Malkawi is retrofitting 20 Sumner Road, built almost 100 years ago, to become an ultra-efficient building and ultimately the Center's headquarters. An extensive renovation project has begun in a house on a side street adjacent to Harvard’s Cambridge campus, but this is no ordinary rehab. 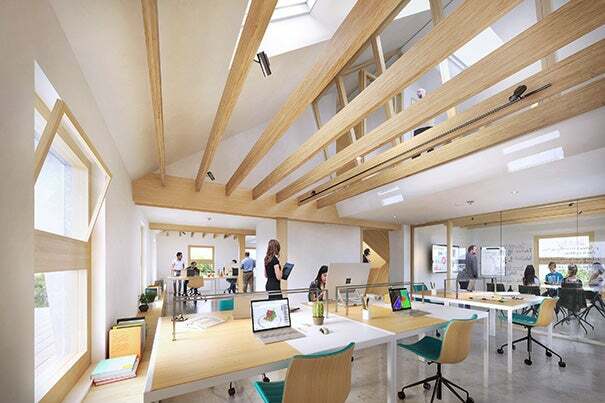 The stick-frame house, which predates the 1940s and is owned by the Graduate School of Design (GSD), will be transformed into an energy-efficient headquarters and lab space for the GSD’s Center for Green Buildings and Cities. It is the culmination of three years of research and design led by Director Ali Malkawi to create a structure that is a working example of the center’s creative goals. 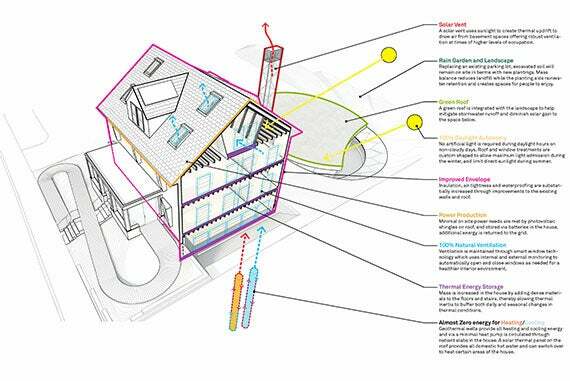 The HouseZero project that began this month is meant to produce more energy than it consumes — with zero carbon emissions and using daylighting and natural ventilation instead of an HVAC system — while serving as a learning center for students and a testing ground for emerging technologies. It will also illustrate deep energy retrofits and could serve as a transferable model for the more than 14 million residential houses of its type in the United States. Malkawi sat down with the Gazette to discuss the project in detail, highlighting the role he hopes it will play in moving building design toward ultra-efficiency and using as little energy, materials, and resources as possible. GAZETTE: As a designer, what do you think are some of the essential skills your profession can bring to bear in addressing the environmental and climate challenges our world faces? MALKAWI: If you design a city well, then you make it easier for people to design buildings. If buildings are designed well, it trickles down to the occupants, and so on. This design component becomes extremely important in ensuring the environment is very well conceived. The interesting part of design as the essential concept here is that designers deal with very complex topics, with problems that are ill-defined. The way designers are educated allows them to be able to engage with this complexity of the living environment indoors as well as outdoors. 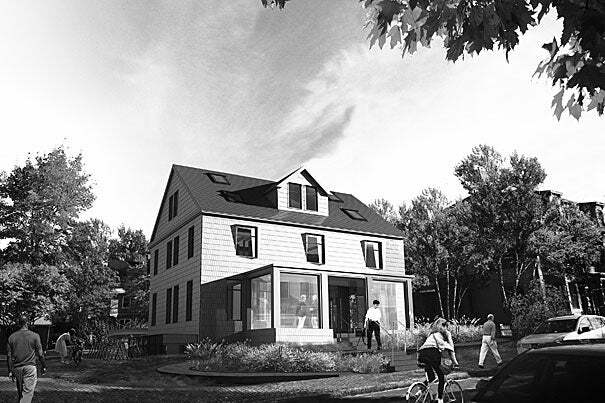 GAZETTE: Switching gears to the project itself, what was the genesis of the HouseZero effort? MALKAWI: The center deals with long-term research issues. At the same time, I am very aware that you have to be able to translate these long-term questions into solutions that are applicable to what is needed now. Being in a university setting and having the knowledge that we have accumulated, we thought it would be important to be able to see what we can do with existing technologies and design ideas that enable us to have ambitions that have not been met before, as well as change the perception about certain challenges that we have in relation to the built environment. Hence we said, let’s take this house that is already owned by the GSD and use it to do an ultra-efficient retrofit. Then maybe we can change perceptions about what can be done. We had several goals: the translation of research and growing the belief this can be done; having a showcase where we will be able to use our own grounds to conduct research; connecting the physical to the computational in order to conduct economic analysis, health analysis, collect data, and share it with others; and creating an ability to change technologies within the structure over time to assess their usefulness. GAZETTE: What are some of those challenges in the built environment that you are seeking to overcome? MALKAWI: One is that it is very difficult to ventilate a structure with only natural ventilation rather than mechanical systems, or to be able to predict movement of air in a way that is equivalent to any structure controlled by HVAC systems. So we are looking at what you can do with existing structures to make them close to having no heating or cooling, while enhancing the quality of the thermal and built environment inside. We want to push this ultra-efficient idea without changing the envelope both visually and materially. For example, we won’t be using super-insulation. One of the most difficult issues will be setting the inside temperature within a range that is predictable. You won’t have the traditional HVAC systems that make it easier to make temperature more predictable. Instead, you are relying on the outside natural environment. So the question became: How will you be able to do these predictions? How will you be able to get the temperature for occupants that is required by code that will allow them to function well? GAZETTE: Using natural ventilation as an example, how hard would it be to shift this to a larger office building? MALKAWI: It shouldn’t be that difficult. You will need to have the expertise to do those predictions, and ensure that the team of designers and consultants are coming from the same perspective. 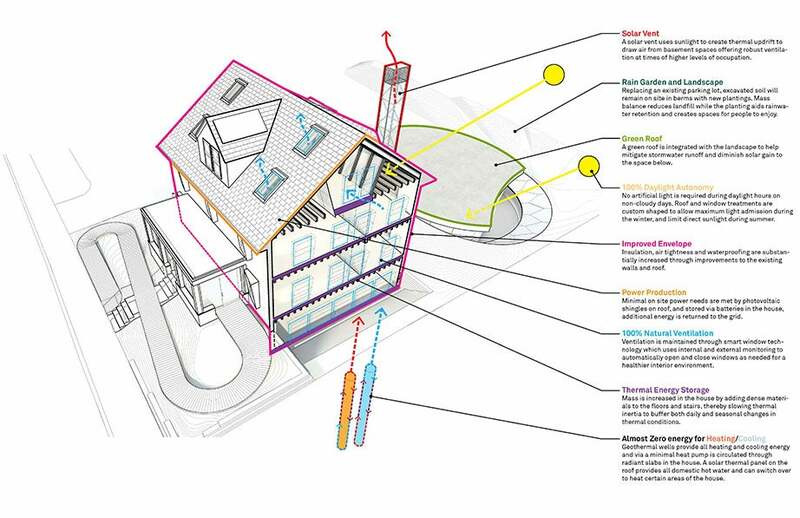 As we were designing this project, we were able to test ideas and publish some of those ideas for the predictability aspects of natural ventilation. One of the questions we tried to ask and resolve in our research project is: What are the boundary conditions for computational simulations to predict ventilation appropriately? So we applied these studies to the house, which allowed our consultants to use part of the data from our research in the design of the structure. We will actually be putting sensors on the outside of the building envelope to measure pressure on the façade, which will be translated into how much air flow is coming through, and coupling them with computational scenarios and visualizing how the air is flowing through the building. So in many forms and fashions, it is not your typical building. But it’s not just about the building, it’s about its future. Inherently part of this concept is building the structure really well so technology becomes almost irrelevant because the building will be so efficient. You will be able to plug and play with the technology as it evolves. Though this is a stick-frame building, the same ideas can be applied to other types of homes or structures throughout the world. We will be able to translate some of our learning lessons, not just now but as it evolves. It’s not about globalization. It’s about localization related to principles that can then be applied. GAZETTE: How have students been involved in the project to date, and how do you envision their role through construction and once it’s completed? MALKAWI: There are two parts. During the design process, there was a stage of doing research where we engaged advanced students and included some of our challenges in classwork through building simulations. Once the building is finished, we anticipate developing an educational component that would help not just our students but the broader community understand the concept of ultra-efficiency. GAZETTE: There are a lot of terms being thrown around for houses that seek aggressive energy targets: net zero, energy positive, passive house. How would you describe this house to someone? MALKAWI: We’re moving away from all those definitions to the inherent and most important aspects of what buildings should have: ultra-efficiency. We would like that efficiency to be translated to different metrics, from social issues to aesthetics and resource use. Once you have that, technology becomes a layer you can add. As better technology comes along, you can produce even more, if you wish to. But you want it to consume as little as possible. For me, I have been advocating from the beginning that, rather than energy production, it’s energy reduction we should look at. We should start from the demand and how you can make the demand as efficient as possible. We’ll also have a house within a house, a laboratory space that will be a structure completely separated and thermally isolated from rest of the building and completely sensed differently. We will be able to apply future ideas to the spine of the building to see how useful they are. It’s a sensitivity issue. You will be able to look at technologies that are applicable to ultra-efficient houses. This allows you to push beyond ultra-efficiency over time. GAZETTE: Is there a design application or feature of the building that you are particularly excited about? MALKAWI: I’m excited about the possibility of collecting and analyzing data, and then being able to change the operation of the building in multiple ways so we can understand how to make it better. At the end of the day, we wanted to push a standard that doesn’t exist that will push efficiency to its limit. We wanted to identify that standard, and show that it’s possible and performance-driven. One last aspect I wanted to mention is the carbon issue. We have been including in all our decisions the embodied energy as well as carbon in the material for us to be able to ensure that it’s also part of what we’re trying to accomplish. So that made our job even harder. We wanted to see what can be done with existing materials to allow us to reach zero carbon structure, including the embodied energy. When you turn all of these ambitions into actual outcomes, we believe that this is the first retrofit of a structure of this kind that we know of that will accomplish all of these goals. Inspired by arthropod insects and spiders, scientists George Whitesides and Alex Nemiroski have created a type of semi-soft robot capable of walking, using simple materials such as drinking straws and inflatable tubing.